How can I remove carpet adhesive from hardwood floors? We are doing some renovations to a home we just purchased. 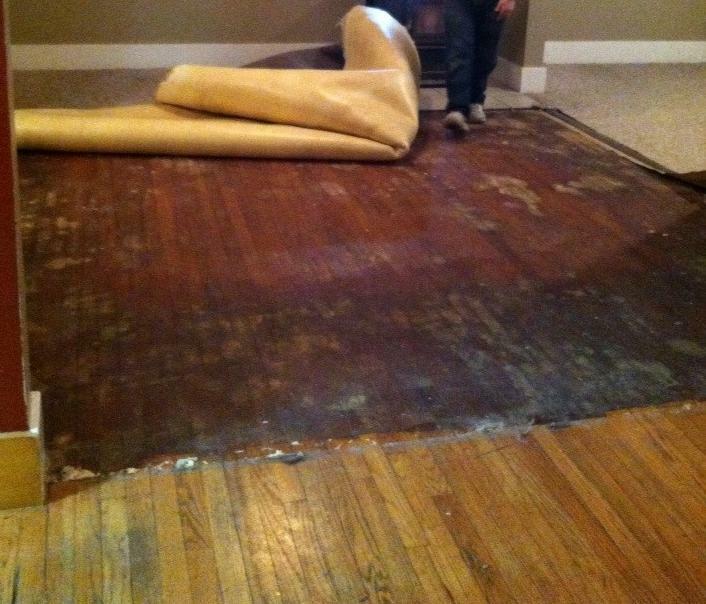 The carpet had hardwood flooring under two layers of carpet. The bottom layer of carpet was glued down by a dark amber colored adhesive. Does anyone know how I can remove the adhesive from a hardwood floor? I have tried mineral spirits to no avail. I also tried some hot soapy water. It worked to some extent but it there was still a lot of scraping needed to get it up. Re-did some floors a couple of years ago with the same situation, two layers of carpets on hardwood floor with the bottom layer glued down. We used heat gun and scrapers to remove most of it, and then some glue remover on the worst parts. After doing this the person that came in and re-did our floors said that was not needed, especially the glue remover. He said the sander would have taken it all off. So I would still probably try scraping up as much as possible and then let the sander do the rest of the work. I use WD40 and it comes right up. Let it soak for five minutes then scrub. Not the answer you're looking for? Browse other questions tagged flooring hardwood-floor adhesive or ask your own question. How to remove construction adhesive from concrete? How to remove floor adhesive from concrete? How can I remove construction adhesive from finished wood flooring? How to remove glued down carpet pad? How do I remove carpet adhesive from concrete? How clean does concrete floor really need to be for peel and stick flooring?